Hamsters usually thrive on a diet of hamster pellets and occasional treats. In the wild, hamsters eat plants, seeds, insects and fruits; in captivity they often favor one type of food, which leads to an unbalanced, unhealthy diet. Hamster pellets containing carbohydrate, vitamins, minerals, 16 percent protein and 4 percent to 5 percent fat meet hamsters' nutritional needs. Fresh vegetables, timothy hay, cooked meat or fish, and a small amount of seeds or nuts add variety to hamster diets. Hamsters enjoy carrots, cucumber, pumpkin, squash, spinach, celery, green peppers and other fresh vegetables, and some fruit. Wash vegetables and fruit thoroughly in cold, clean water and cut them into small pieces before feeding them to hamsters. 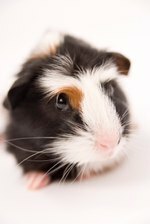 According to the Purdue University College of Veterinary Medicine, vegetables such as broccoli, iceberg lettuce, green potatoes, garlic, cauliflower and potato eyes give hamsters gas -- avoid them. Hamsters eat about 2 teaspoons of food a day, including hamster pellets. Fruit hamsters can eat include apples, blueberries, plums, figs, strawberries, bananas, cut grapes and pears. Give hamsters a half-teaspoon to 1 teaspoon of vegetables, fruit or other treats two or three times per week. Timothy hay, a sweet-smelling green hay, supplements hamsters' diets and provides fiber. The Purdue University College of Veterinary Medicine advises hamster owners to give a handful of timothy hay two or three times a week. Don't feed hamsters alfalfa hay. Alfalfa hay is high in calcium, which can cause health problems for hamsters. Cooked meat, fish and egg supply hamsters with protein. **A half-teaspoon of cooked chicken, tuna and hardboiled egg, finely chopped, provides an occasional supplement to hamster diets. You can feed hamsters the same amount of chopped cheese, though the Florida Atlantic University Veterinary Services website states that hamsters should not be fed other milk products. Hamsters should eat only small amounts of nuts, seeds and grains, because they're high in fat. Hamsters enjoy these foods, but high-fat diets increase hamster mortality, according to Florida Atlantic. A large pinch of sunflower seeds, bird seed, cracked corn and other foods high in fat every two or three days is a welcome treat to most hamsters. The website for the Veterinary Medical Teaching Hospital at the University of California at Davis says that making seeds part of hamsters' everyday diet causes problems. Seeds don't supply all the nutrients hamsters need, but hamsters often favor seeds over hamster pellets. Don't feed hamsters junk food such as chocolate, candy and other edibles high in sugar. Plenty of foods you might think are healthy for hamsters are not: Raw beans, rhubarb, peaches, apricots, nectarines, pineapples, raspberries and citrus fruits are harmful to hamsters. Spoiled foods are harmful to hamsters. Remove leftover fresh and dry food from hamster cages every day. Check in the habitat corners, the bedding and other hiding places, because hamsters like to store food to eat later.